Angela Bawden's wall and window mural art. Featuring artwork and paintings by Angela Bawden and past mural paintings that she collaborated with her sisters, Amy Hasna and Eva Bawden. We didn't choose the red background color but we still like the way this painting turned out. 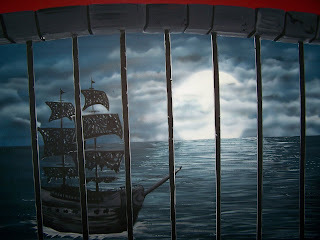 The intention of the mural was to make it appear like you were in a jail cell and looking out the window at the black pearl pirate ship form Pirates of the Caribbean. We used and airbrush to paint the moon and clouds and regular acrylic and latex paints for the rest. Wall Murals are a great way to add character and excitement to any themed room or decor. Angela can help you come up with design and ideas or paint what you already have in mind. If you can dream it she can paint it!! SPECIAL finishes / faux painting sign painting etc. *Fantasy book Mural / library, fairies, tree etc. *Girls fantasy room / Repunzel, castle, dragon etc. *Girls rooms Trees, fairy's clouds etc. We can refinish cabinets and do unique faux finishing. We can plaster walls for any effect. We can also recreate effects from photos. We also do Window Painting! Ask about our window painting services. window art is a great way to brighten up any window! We do Holiday window art and window advertising. Window advertising doesn't cost , it PAYS! Window Paintings can bring all eyes to any store front. They advertise 24/7!! It is a great way to draw attention to your business. We can customize your windows to go with your sale or theme!! Let your sale or special be known to ALL who pass by! Bawden Art and Bronze-- Our father, Dee Jay Bawden's web-site. Scroll through the list of our work by theme to the upper right of this page. "He who works with his hands is a laborer. He who works with his hands, and his head is a craftsman.He who works with his hands, and his head, and his heart, is An Artist"
Angela at work, painting a palm tree! !